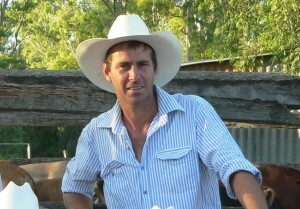 Cattle Council of Australia president Howard Smith. The recurring message that has been continuously reinforced throughout the long-running grassfed cattle industry restructure process is that grassfed levy payers want greater control over how their grassfed levy funds are spent. After years of debate, various groups that represent grassfed levy payers last week reached a consensus position on a structure that they believe will give all grassfed levy payers a stronger say in how grassfed levies are invested. 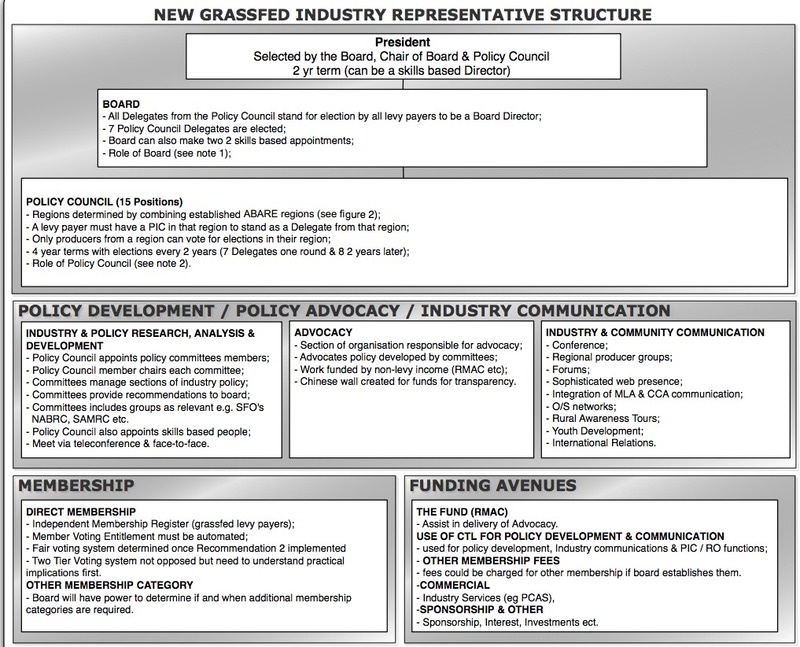 The structure the groups have landed upon will, if ultimately adopted, see the current peak body representing grassfed cattle producers, Cattle Council of Australia (CCA), change from having a board appointed by State Farm Organisations to a new policy council and board comprising directly-elected grassfed cattle producers from around Australia. As Beef Central reported last week, the new structure was agreed to by several grassfed industry groups including CCA, the Australian Beef Association, the Australian Meat Producer’s Group, The Concerned Cattle Producers Group and State Farm Organisations at a meeting in Sydney. The new structure was presented to Federal Agriculture Minister Barnaby Joyce in Canberra yesterday, who praised the groups for putting aside their differences and coming up with a united position. “I recognise this has been a long and arduous process for industry to this point and they must be congratulated accordingly,” Mr Joyce said in a statement released after the meetings. While achieving a unity position on a new structure has been seen as something of a watershed moment for the grassfed industry, important and unresolved questions still remain. For example, what does the average grassfed cattle producer think of this structure? Will they get to have a say before it is implemented, or will the united position of the various grassfed groups involved be considered adequate proof of widespread producer support? The Minister has said his department will now work to see how the chosen structure can be implemented, but said he will not rush into an immediate decision. He reportedly told the grassfed groups in Canberra yesterday that his department will analyse what has been presented and expects to come back with an answer in around two months time (mid April) on how the restructure process should go forward. Some of the issues the Department will look at include how the voting system would work, and what affect this restructure would have on other groups such as MLA and the broader beef industry supply chain. “Given the gravity and importance of each of the Inquiry’s recommendations it is vital that we take the time to get this right, and be cautious of an immediate response,” Mr Joyce said in his written statement yesterday. “I want to assure grass-fed levy payers that the government is committed to achieving the best possible outcome on their behalf, however change is not as simple as the flick of a pen and I hope to have a formal response, after considering all seven recommendations, tabled in the coming months”. One of the critical questions yet to be resolved is how the newly structured body would be funded and how it would control the expenditure of grassfed levy funding. The new body would receive all grassfed levy funds but the MOU between MLA and the new body would adjusted to ensure the new body distributes sufficient levy funds to MLA to ensure its survival. CCA yesterday released a three page document providing some details of the proposed structure. It has not released the full 14-page document that was reportedly presented to the Minister though, which is said to contain more detail on proposed voting systems, suggestions on future funding arrangements and possible budgets. From the details that have been released, the future national grassfed cattle producer representative body would be managed by a board of seven directly elected councillors. The board would also have the option to expand by appointing two skills-based members if deemed required, or an independent president. Beneath the board would be a 15 member directly-elected policy council. Australia would be divided into 15 cattle producing zones. Each levy paying grassfed cattle producer would have the right to stand for election as a policy council delegate in the zone/s they have PIC. All grassfed levy paying cattle producers would then have the right to vote to elect the candidate to represent their zone on the 15 member policy board. All of the 15 delegates elected to the policy council would also stand for election by levy payers to fill the seven positions on the board. “If you put your hand up for one of those regions, of the 15, you have to be prepared to also be elected onto that board of seven,” CCA president Howard Smith said. Mr Smith said a 15 person board was too large for the operations of a board, and drawing the board members from the policy council ensured there would be no disconnect between the two bodies. He said the 15 representatives of each region will also have to be accountable to their regions. Mr Smith said he believed the new structure would give grassfed levy payers control of their destiny. “I think it will mitigate a lot of the angst that has been in the industry for years. “It is fully democratic and with that comes responsibilities and risk. The CCA, ABA, AMPG proposal handed to Joyce on Tuesday is the same old same old stuff, give us more money and we will do better this time around. Good grief!! The proposal itself is about money for CCA (not a new corporation but CCA) and maybe addresses No1 Senate recommendation and the rest seem to have disappeared except they are leaving the government to do something about No.2(identifications and voting entitlements). God knows about Senate Recommendations 3,4,5,6 and 7!!! “5.1 Set levy Expenditure – CCA staff bring together committee feed back on relevant sections of MLA AOP, AHA AOP and NRS plan combined with the CCA plan and ensure overall funding is adequate. There is no mention that existing levy funds (consolidated revenue) is wasted and marketing levies do not increase farm gate profitability and returns, and a levy reduction must occur as a result of the poor performance. The two items above are about future levy increases. I say grass fed cattle producers are not going to wear any more increases for ineffective levy use. It is time for a grass fed producer referendum on whether we should pay levies at all, the same value as the return to grass fed producers from past levy collected ,ie zero!! So…after three years of CCA naval gazing, a senate inquiry and the complete erosion of effective advocacy for Australian cattle producers, we’ve come up with the following: a new miracle body that is either (A) going to receive the entire levy or (B) receive almost $4m in levy monies? Is it just me, or is there something blatantly missing from this picture? Aside from the obvious need for some cultural issues to be rectified within MLA, apparently almost all of the problems in the beef industry can be attributed to lack of money to support CCA? Let’s turn that around and have a look at MLA. Relatively flushed with resources, they have fairly (and in some cases unfairly) earned the wrath of some sectors of the industry for not delivering value, for inadequate transparency, for cultural arrogance, etc. In other words, both CCA and MLA have been widely criticised as having significant problems in how they operate, yet there seems to be no correlation between these shortcomings and their respective budgets. This can only lead me to think that perhaps…just perhaps… money actually ISN’T the issue that needs to be fixed. Yet, right now we still have three groups, all claiming to better represent cattle producers than the other, in universal agreement that the solution lies in getting in more money. At one end, the new body directly receives ~ $50 in income, wholly and solely managed by a popularly elected “Board” of producers. I think it was John Carter, the founder of ABA, who himself said that’s akin to letting the inmates run the asylum centre. And from memory…I don’t think it was meant to be a compliment. I’m having a lot of trouble seeing how any of these great ideas translate into actual benefit for cattle producers…apart from the five or so who happen to attend the Rural Awareness Tour, those travelling on critical international delegations to build O/S networks …or those specifically skilled at building Chinese walls. Pardon my cynicism, but if this is what the best and brightest industry minds can come up with…maybe its time to look for even better and brighter minds? Regardless of who’s doing the naval gazing, it’s about time we shifted the discussion away from”who’s gunna control the money”. Form always follows function – the questions around board composition, election processes, how much funding and where it comes from should be left until after the industry has a much clearer picture of EXACTLY where and how they’re going to benefit from any reform. Otherwise, you can guarantee we’ll end up doing the same old things, the same old way…all the while chasing more and more money to fund it.